I am always pleasantly surprised when things don't go as poorly as I anticipated. When Timm is in Africa, I steel myself for the worst. But this week has actually not been that terrible. The kids and I are making it. 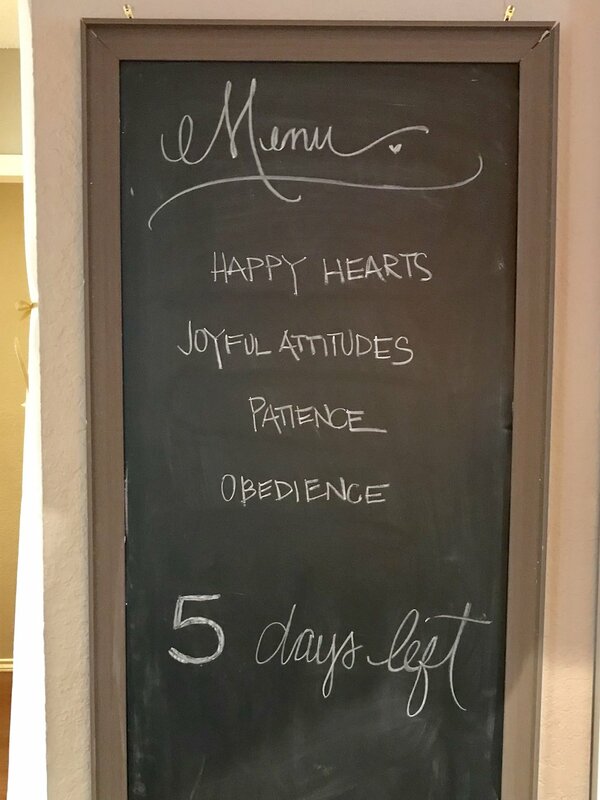 We have a countdown working on the chalkboard in our breakfast room, as well as a reminder of what we all need to put on every day. Namely, joyful attitudes, obedience, patience, and a happy heart. We are all doing the best we can. Each day has held an activity (apart from the usuals of school and work), and the welcomed distractions are making the time fly. Five days left until he comes home. Praise be. I read the best article on the etiquette of a Sip and See. What is it? Who has one? Who hosts it? Gifts or no gifts? Lee shares practical advice and kind direction on how to navigate modern social situations. This article was a lovely (and helpful) representation of what she offers, and her blog is one of my favorites to follow. We have officially crossed the line on gender reveals. As we continue to up the ante, something was eventually going to be too much, and that moment has now arrived. I can't stop watching this video, and with each subsequent viewing, I laugh even harder. Please, please take a moment and watch this clip in its entirety. Do you know what Wasa crackers are? I remember Wasa fondly from my childhood, which is a strange association once you see or taste a Wasa. Further from a well-loved children's food they could not be. Out of nowhere I decided I needed them back in my life this week. I expected to have to hunt for them, but as it turns out Central Market has an entire shelf dedicated to Wasa and all the flavor varieties. I brought some to work, to see if anyone else knew of them or enjoyed them. They did not, and they did not. Wasa crackers taste like cardboard and have the texture of large grit sandpaper. They are dry, thick, and insanely crunchy. You could injure the roof of your mouth if you chew Wasa the wrong way. Wasa has been around since 1919, and originated in Germany. Ada and I are convinced they originated during some sort of war-realted survival situation. Dried bricks of stale bread were repackaged with a fancy name, and ninety-nine years later they are taking up an entire shelf at a specialty food store. Genius. I don't know why I like them, but I do. If you're wondering what to get me for Christmas, this will do just fine. Is she not the most gorgeous thing you've ever seen? Also, one hundred years! Who knew? Oh, that's right. Martha knew. Martha always knows. We revisited Kristin Wiig's character on SNL, The Target Lady. We basically belly-laughed through an entire lunch watching old sketches. Which then led into our retail staff reinacting the antics, and embarrasing ourselves as we hollared, "Approved!" when processing debit cards at the counter. We pulled it together and returned to more on-brand professional behavior, but if you hear one of us respond to you in a thick, throaty, awkward voice, and say something about candles, you'll know why.